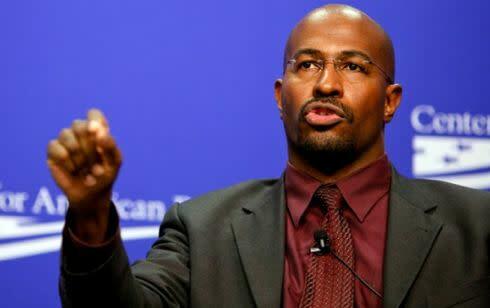 Former Obama administration green jobs czar Van Jones said Saturday the Occupy Wall Street movement essentially "saved the entire country from destruction." Jones made the comments in Los Angeles ahead of his appearance at an "All in for the 99%" training event, saying Occupy "disrupted the narrative" as both parties "barreling toward more austerity." "[The] Occupy movement pretty much saved the entire country from destruction," Jones said in an interview posted online. "Both political parties were barreling toward more austerity, more cutbacks, more pain for the people and more -- basically both political parties had managed to converge on this idea of basically no rules for the rich, no rights for the poor, no middle class to speak of. That was basically the agenda, the question was just how much pain how fast." "Occupy Wall Street came on and completely disrupted the narrative," he said. All the 'austerity, austerity, cut, cut, cut' stuff went away and suddenly even Republicans had to talk about income inequality and that whole theme. Occupy Wall Street really kind of, like, helped us to hit a reset in the country." Jones compared Occupy Wall Street to the Student Nonviolent Coordinating Committee [SNCC] of the 1960s, the organization that played a major role in the sit-ins and freedom rides of the civil rights movement. "They were the young ones, they were the most aggressive, the most passionate," he said. Jones said next week will kick off a massive training effort, in the style of the 1960s, to teach protesters nonviolent civil disobedience. In what's being called "The 99% Spring," Jones' organization, Rebuild the American Dream, is partnering with the SEIU, MoveOn.org, the Domestic Workers Alliance and others to train 100,000 people across the country in direct action. "We'll have this standing contingent of people who want real change who understand the issues," Jones said.